Lipscomb students awoke to an unpleasant surprise Saturday morning. 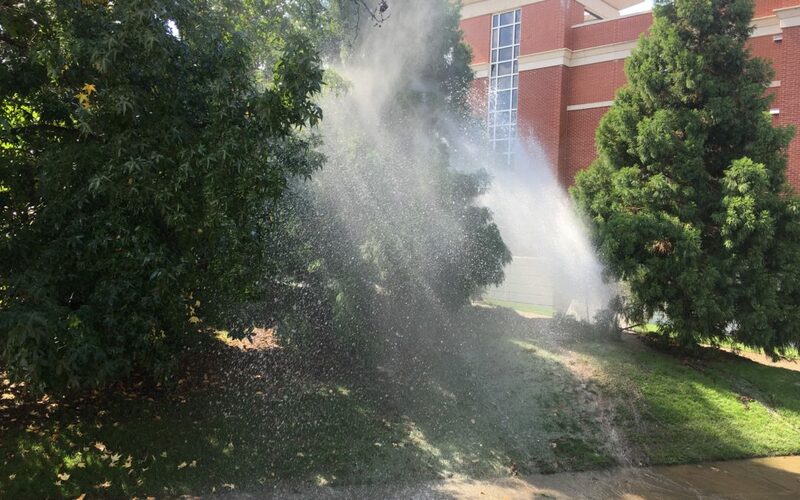 An apparent water main break on the south side of campus left several buildings without water access. Water was seen gushing from pipes on a grassy hill between Sewell and Johnson Hall, leaving Sewell’s parking lot partially flooded. Sewell, Johnson and High Rise Hall were all without water late into the afternoon. Lipscomb spokesperson Kim Chaudoin sent an email to all Lipscomb students and faculty detailing the University’s plans to fix the problem. Water service was eventually restored to all University buildings other than Sewell by 6:30 p.m. Saturday evening. “The Campus Service Operations team will be shutting down water services to that end of campus from 2-5 p.m. today to make a repair that will restore normal water operations,” Chaudoin said in the statement. During the 2-5 p.m. window, water service to Allen Arena, the Student Activities Center, McQuiddy Gym, Johnson Residence Hall, Sewell Residence Hall, High Rise Residence Hall, Bennett Campus Center, Swang Business Center and the Burton Health Sciences Center was unavailable. Buildings on the north side of campus, like Bison Hall and The Village, were among those unaffected by the water issue. Lipscomb Dining Services has also returned to its normal operating schedule. The incident occurred as many University students and parents gathered on campus for Family Weekend, highlighted by the annual Tau Phi Cowboy Show Saturday night. This story was updated at 2 p.m. with Chaudoin’s statement and again at 8:30 p.m. after water service was restored to all buildings except Sewell Hall.